The new subscription options are part of Facebook’s effort to give users more control over their Facebook accounts and their News Feeds. “Facebook has always been working on giving users more control,” said Facebook Product Manager Naomi Gleit. Starting Wednesday, users will begin seeing a Subscribe button alongside the “Message” and “Poke” button on Facebook profiles. The button gives you a way to follow the content others are posting without actually becoming Facebook friends with them. In a lot of ways, it’s like following somebody on Twitter. This button works a bit differently based on whether you’re looking at a friend’s profile. If you subscribe to the profile of somebody who is not your friend, you will get access to his or her public status updates in your News Feed. You can fine tune what type of updates you see. For example, you could subscribe to my Facebook Page and choose only to see my status updates and ignore my game or photo updates. If the user is your friend, subscribing gives you the ability to granularly control how much of his or her content enters your stream. If you want to see every post your significant other is posting to Facebook, you can set the Subscribe button to show “All Updates” in your News Feed. On the other hand, if you want to ignore one of your acquaintances unless he gets engaged, then you can select the “Only Important” option under the Subscribe button. The Subscribe feature is totally optional — you can choose not to subscribe to anybody, and you can choose to turn off the Subscribe button on your profile if you don’t want to gain any subscribers. Much like Twitter, the total number of people subscribing to your public posts and the number of people you’re subscribed to appear on your profile. This number does not include pending friend requests. Existing friend requests will not turn into subscribers automatically, but Gleit says that going forward anybody who sends you a friend request will automatically be subscribed to your public updates (unless you turn the Subscribe button off). 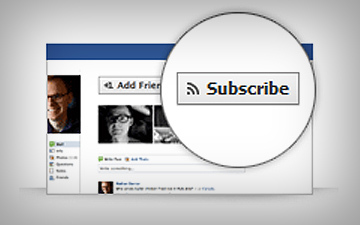 The Subscribe option makes public Facebook posts more useful, especially if you start gaining an audience. However, it provides yet another layer of complexity on top of an already complex product. It could spur more public sharing a la Twitter, or it could raise more privacy concerns for a social network that has had its share of privacy controversies. What do you think of the Subscribe button? Is it a smart addition to Facebook, or is it a useless feature? Let us know in the comments.